CinemaCon is one of the largest and most important gatherings of movie exhibitors from around the world and CJ 4DPLEX kicked off this year’s convention by announcing a significant, expanded partnership with Cineworld Group plc that will result in 145 total 4DX auditoriums around the world. 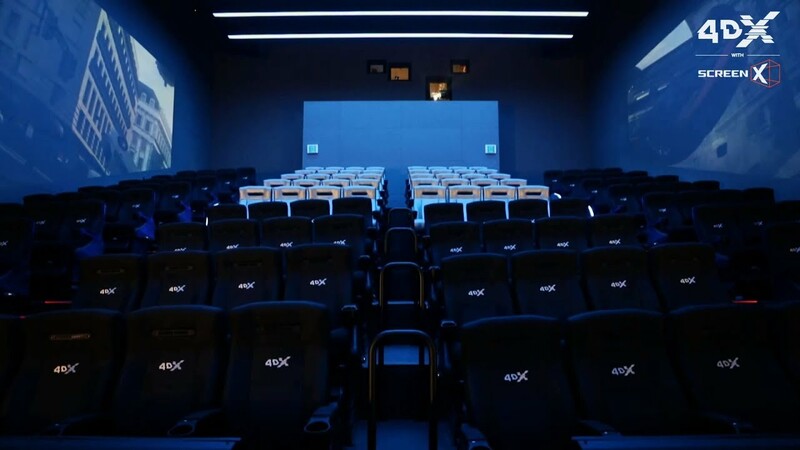 This includes adding 79 new 4DX locations at Regal Entertainment theatres in the U.S. (bringing the total to 85 in the country) and adding 20 at Cineworld Cinemas and Cinema City-branded theatres (for a total of 60 in their locations in Europe and the Middle East). “Being at the edge of cinema exhibition is always a goal and working with CJ 4DPLEX is one of the ways we can deliver future-thinking cinema experiences to our audience members,” said Mooky Greidinger, CEO of the Cineworld Group. CJ 4DPLEX also announced a new partnership with Cinemacity, the leading cinema exhibitor in Saudi Arabia, to bring three 4DX locations to the country by the end of this year. Furthermore, 4DX – which as of May 2018 is in 510 theatre auditoriums, spanning 59 countries – continues to expand across Africa, announcing a deal with Silverbird Cinemas, the leader in the Nigerian leisure and entertainment industry, to bring the first 4DX site to Nigeria. It will be located in Ikeja at the highest-grossing cinema in West Africa. ScreenX expansion was also announced at CinemaCon. B&B Theatres will be bringing four new ScreenX locations to the U.S. by 2019, including the largest ScreenX screen in the world in Liberty, MO. This more than doubles the number of theatres in the U.S. that will have the ability to bring moviegoers access to the panoramic, 270-degree, multi-projection format. Other ScreenX news from CinemaCon includes the announcement that one of the major Hollywood studios, Warner Bros. Pictures, intends to make up to five upcoming titles available in the premium ScreenX format over the next 12 months. Following the recent successes of Rampage, upcoming titles announced at CinemaCon include The Nun, Aquaman and Shazam!. ScreenX is the world’s first multi-projection system designed to enhance the cinematic immersiveness of the theatre setting. It was created in 2012 by CJ CGV, part of South Korean conglomerate CJ Group, as one of the company’s industry-changing “next cinema formats”, alongside 4DX, the global-leader in multisensory cinema technology with motion and environmental effects. ScreenX allows moviegoers to experience beyond the frame of the movie screen by utilizing a proprietary system that expands images of feature films and pre-show advertising to create an immersive, panoramic, 270-degree format that projects onto three walls of theaters. To date, ScreenX has been installed in over 141 screens around the world, including 86 screens in South Korea; 43 screens in China; 3 in the United States; 4 in Turkey; 2 in Vietnam and 1 in Thailand, Japan, and Indonesia. CJ 4DPLEX is the world’s first 4D cinema company, headquartered in Seoul with international offices in Los Angeles and Beijing. The company created 4DX, the first and leading 4D cinema technology for feature films, providing moviegoers with an immersive cinematic experience that utilizes all five senses, allowing the audience to connect with movies through motion, vibration, water, wind, snow, lightning, scents, and other special effects that enhance the visuals on-screen. CJ 4DPLEX brings 4DX auditoriums to exhibition partners along with 4DX codes for both major Hollywood blockbusters and local titles. Each auditorium incorporates motion-based seating synchronized with more than 20 different effects and optimized by a team of skilled editors, maximizing the feeling of immersion within the movie, beyond the limits of audio and video. Since 2009, more than 520 Hollywood and local titles have been screened in 4DX. As of May 2018, more than 61,000 4DX seats operate in 510 auditoriums spanning 59 countries.